This week we released tools and monitors that test your servers for DKIM and DMARC standards compatibility. These two standards help companies send and receive email more safely and should be used by any company running their own email servers to ensure email deliverability. DKIM, or DomainKeys Identified Mail, is a standard that allows an organization to cryptographically sign an email message in order to take responsibility for that message. Receivers can then use this digital signature in their process for approving or rejecting the email in their spam filter. As DKIM signatures are associated with a domain, the reputation of that domain is the basis for evaluation. DMARC, or Domain-based Message Authentication, Reporting & Conformance, is a standard for how email receivers authenticate email messages using SPF and DKIM. DMARC policies are published by senders via DNS. These policies tell a receiver that the messages sent were protected by SPF and DKIM and how to respond to messages that did not pass the receivers filters, such as spam filters or virus filter. Email is a generally insecure method of communication. Spam and phishing attacks leverage email because it easy to spoof and highly trusted by naive consumers. For example, many people trust an email simply because it contains a company’s logo and appears to come from that company’s email address, both of which are easy to fake. Email service providers like Google (Gmail), Microsoft (Hotmail/Outlook.com), and Yahoo! value DKIM and DMARC because it simplifies their algorithms for filtering trusted email from spam and phishing attacks. If you are a small business targeting business or consumer customers, you need to adopt DKIM and DMARC to ensure your emails get through to your customers. How do I use MxToolbox? Once you have DKIM and DMARC setup, you can use MxToolbox to check your configurations and ensure they are accessible to the outside world. We even offer these as monitors which will alert you if DKIM or DMARC is unaccessible or changes. 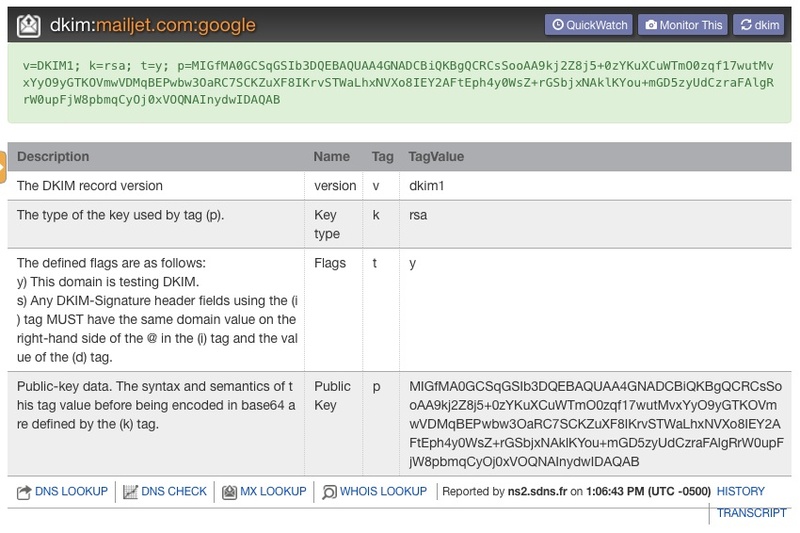 As with all our DNS monitor types, DKIM and DMARC monitors check your configuration every 5 minutes. This entry was posted in Uncategorized on April 23, 2015 by MxToolbox Blog. Today’s Wall Street Journal article, ‘Ransomware’ a Growing Threat to Small Businesses, is a great synopsis of the threat organized and skilled cyber criminals pose to small businesses every day. Many small businesses run without any sort of spam, virus or malware protection so they make easy and attractive targets for criminals looking to make an easy buck (or bitcoin). At MxToolbox, we see this issue arise daily. Small businesses contact us because they are on a blacklist only to discover that it was a malware infection caused by malware from spam or an infection caused by following a spammy link. Ransomware attacks start in exactly the same way, a spam email with a legitimate looking website or an attachment. All it takes is an errant click or opening the wrong attachment and you’re infected and your business grinds to a halt. Recovery can take you hundreds of dollars or dozens of hours, whether you pay or recover from a backup. Do you have an offsite backup? Most small businesses don’t. Our first recommendation for your small business to survive a ransomware threat, a fire, a tornado or any business continuity issue is to immediately invest in a cloud-based or other type of offsite backup, and backup your entire business. This will protect against these large issues but also against simple accidents that could harm your business. Have you ever deleted a file and immediately wished you hadn’t cleaned your Recycle Bin? If you are running your own email system, you need to protect it. We highly recommend some sort of comprehensive spam, virus and malware protection on your servers. Basic spam filtering isn’t enough and will not capture the zero-day outbreak type malware or attachments that are used by ransomware attacks. You need to filter for malware and viruses as well. This one is a little harder. Spam email, especially with zero-day outbreak attacks, can include links to sites that are neutral at the time the email is sent, but activated shortly after to become malicious. This type of attack is very difficult to protect against and often uses phishing style emails that look completely legitimate. Exploits like ransomware get you to click on these links and download software to infect your systems. New technologies can protect you from these types of seemingly normal, but malicious links. Email Protection + Continuity provides inbound and outbound mail filtering to ward off spam, malware and other email-based attacks. Outbound filtering means that even should your servers be compromised, spam will not be passed on to your customers. With Continuity, should your email go down, your users will still have access to send and receive email while you work the issue. Total Security includes everything from Email Protection + Continuity but adds in DNS and URL filtering of websites, both of on-premise and mobile devices. With Total Security, your users are protected even if they click on links that download ransomware, botnets or malware and also protected from botnets reaching out to host servers to start the encryption process. Note: As of Monday, April 20th, PBS has another article on Ransomware. This entry was posted in Uncategorized on April 16, 2015 by MxToolbox Blog. For the past year, our Zimbra customers have probably been wondering if they would ever get anything new from us. Now, we actually have something for them. MxToolbox is upgrading Zimbra to the latest release on April 18th! This is a free upgrade that all current Zimbra users will receive with absolutely no work required of the user or customer. MxToolbox will cut everything over to the new version on April 18th during a short maintenance window. The Zimbra Web Client has been completely redesigned with a focus on simplicity and accessibility. The Zimbra 8 interface is more streamlined so that common actions are easily discoverable and highly intuitive to use. In Zimbra 8 email is presented to users in a “natural” conversation view that makes reading and replying to messages convenient and intuitive. Quoted text is hidden and messages are laid out in a way that is easy for users to understand the “in-reply-to” relationship between different messages in the same email thread. Discreet links to Reply, Forward and More Actions (presented just below the email) let users respond to messages quickly and efficiently. Improved composition editor allows users to craft rich text emails, with features such as paste-style support from desktop applications and the ability to include inline images bring the power of desktop word processors to email. In Zimbra 8 tagging functionality has been improved so that when items are shared users cannot only use tags to organize their data but also share these tags across applications as well as mailboxes. Activity Streams allows users extensive control over the messages that go to their Inbox. Users can easily set up activity stream filters that direct incoming messages to various folders (or are deleted from) based on different criteria that they can specify. For example, emails to distribution lists, feed and notifications that are not directly addressed to the user can be archived in folders that can be read when convenient. “Graymail” filtering prevents user’s Inbox from being cluttered by legitimate but unwanted emails. A dedicated search tab is created whenever a user enters a new query in the header search box. This allows users to perform a search, navigate away from the search tab to perform another action such as compose an email, or schedule an event and then come back to the search tab to continue with the query. Zimbra 8 provides users with a simple yet powerful search interface allowing users to perform simple actions such as quickly filter on common attributes or perform complex search queries making use of complex logical operators. Zimbra 8 provides an intuitive and sophisticated enterprise calendaring system that enables users to manage multiple calendars and provides support for advanced scheduling activities. Zimbra 8 has significantly improved the user’s experience when working with the appointment scheduling feature. Once users select attendees, Zimbra 8 can compare calendar availability and provide users with a list of suggested meeting times. Similarly, based on meeting requirements such as the size of the room and location, Zimbra’s scheduler can provide users with a list of conference facilities that fit meeting requirements. Landscape and date range printing provides users greater control over how calendars are printed. Wizard to add external calendars when users right-click to create new calendars. Zimbra 8 supports importing several popular calendar formats including Google and Yahoo! Calendars. Zimbra offers server side implementation of Microsoft’s ActiveSync 12.1 protocol providing end users access to their Zimbra mail on any mobile device that supports ActiveSync 12.1. Auto-discover support enables seamless linkage between the user’s account on the Zimbra server and the email client on the mobile device when valid credentials (email and password) are supplied from the device. In the event that the security of the mobile device is compromised administrators can perform a remote device wipe from the admin console, thus safeguarding against any loss of sensitive corporate data. Since most mobile devices are often on high latency, low bandwidth (reduced connectivity) networks, Zimbra’s ActiveSync implementation has been designed to operate at a reduced bandwidth. ActiveSync protocol implementation has been optimized to conserve battery life for push enabled devices. ActiveSync implementation provides push synchronization of email, contacts, calendars, tasks as well as the Persona/ Alias profile configurations associated with the user’s email address. The introduction of 30 new configuration policies provides administrators more fine-grained control over user accounts and approved applications – allowing them to enable/disable device software and hardware capabilities as necessary. Zimbra UC seamlessly integrates with leading voice systems to deliver all of your business communications in one place. Zimbra 8 is designed so that real-time communication services such as voice, telephony and presence inter-operate with non-real-time services such as email and voice mail – allowing users to benefit from faster response times and companies to benefit from higher group productivity. Click-to-Call offers immediate voice connectivity with call-routing to device or soft-phone. This lets users take office calls at their office numbers on their mobile devices. Zimbra 8 supports the configuration of multiple numbers. Presence provides real-time notification of user’s current availability and ability to communicate. Visual voice mail lets users view caller and voicemail information and supports inline playback and management features. It also supports MWI (Message Waiting Indicator) status updates, allowing users to customize the way they want to be notified about new voicemail messages. These voice messages can be saved in either .wav or .mp3 format. Call history includes information about voice mails received, placed calls, received calls, missed calls as well as details about date, time, and call duration. The Zimbra Connector for Outlook now works with Outlook 2013. Custom retention and disposal policies can be set on a folder-by-folder basis by end users, or enforced globally by IT. The Zimbra Admin Console has been completely redesigned to make administration easier. This entry was posted in Uncategorized on April 13, 2015 by MxToolbox Blog. If you haven’t noticed already we’ve beefed up the diagnostic capabilities of our Port Scanning Tool by adding 8 additional ports. We love making our lookup tools even more powerful and providing you with the information you need – fast. Our updated port scan tool now checks a total of 25 ports to let you know what services are running on your server and open to the world. Here is a list of the new ports the tool now checks for open ports. So, why did we pick these ports? At MxToolbox, we want to help you protect your organization. We selected these ports because they rank high in statistical usage, provide high value services, and can be dangerous. These ports, if exposed to the outside world, can be used to exploit your systems. If you need them open, defend them. If you don’t need them exposed, close them as soon as you can. In short, if we can see them, then these services are exposed to the world and are at risk for hacks, DDOS attacks or data ransoms. Remember to regularly patch systems supporting these services. Keeping a close eye on these ports helps to protect your organization. This test will tell you what standard services are running on your server and open to the world. You can type in an IP address or hostname. We attempt a full TCP connection and graceful disconnect on each of about 25 common TCP ports we test, with a timeout of 3 seconds. Possible results for each port are Success,Timeout or Refused. This entry was posted in Uncategorized on April 6, 2015 by MxToolbox Blog.